Hearts have been reprimanded and warned by the Scottish Premier League for the delayed payment of September salaries. The same problem arose this month, with six players and manager John McGlynn receiving their wages six days late. An SPL disciplinary sub-committee will examine the October breach of their regulations on Wednesday. Hearts had a transfer embargo imposed for the September offence, which will run until the league is satisfied the problem has been resolved. The ban on player registrations is not a specific punishment but is now an automatic trigger when a club is late with payments. The sub-committee, which met on Monday morning before the SPL quarterly gathering at Hampden, consisted of chief executive Neil Doncaster, secretary Iain Blair and Dundee United chairman Steven Thompson. Doncaster said: "I think it's important we don't prejudge anything and hear what Hearts have to say. "We don't know whether the charge is being admitted yet. "So, rather than prejudge the outcome of any hearing, I think it's important we sit down with a clear mind on Wednesday and judge any evidence on its merits." Hearts were late paying players four times last season and the SPL issued a demand in January that they pay players by a certain date following an official complaint by PFA Scotland, the players' union. However, their previous record was not taken into account by the SPL committee. "We can't do that," Doncaster said. "This is a new set of rules that clubs have brought in over the summer. "This is the first breach of those new rules and we had to treat Hearts just as we would treat any other club that breached those rules. "It's a new set of rules and the first breach of those rules." 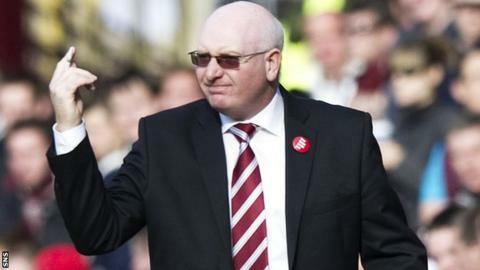 Hearts managing director David Southern told reporters after the hearing that outstanding October wages had now been paid and that funding was still available to the club, the only problem being the timing. The club were pleased to have avoided sanctions at present and will hope to avoid sanctions on Wednesday, arguing that the latest problem had been resolved. "We accept the result of today's SPL board sub-committee hearing and are satisfied that this specific matter is now resolved and closed," they said on their club website. "We also acknowledge the second charge against the club, the subject matter of which the club believes has been resolved internally. "However, the club notes that this will be dealt with separately on Wednesday." With Hearts subject to the automatic transfer embargo, they cannot re-sign Rudi Skacel, the midfielder who is currently training at Riccarton, but the sanction is due to be reviewed by the committee on Thursday.